The Jelly Splash iPhone, iPod Touch, and iPad app is a fun, addictive, and deceptively challenging connect the dots game. It is a cool mix of Flow, Tetris Blitz, and Dots with an easy start that quickly becomes a test of your puzzle skills. The Jelly Splash iPhone app has a peculiar style of graphics, but they are crisp and colorful. The jellies look like blobs of jelly for smearing on toast, but, set against the beach background, they must be colored jellyfish. You connect them horizontally, vertically, and diagonally by color on a standard chess-style game board on a beach. 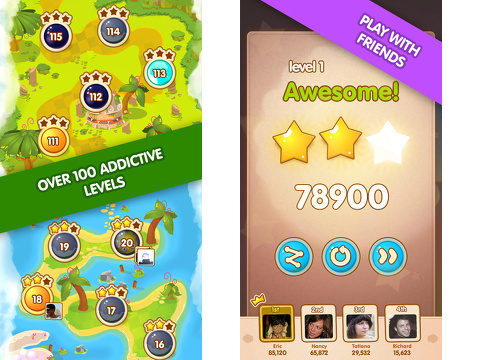 For each level completed, you are transported to a screen with a map of the levels across an island region. The color palette is bright and cheerful, and it helps you stay positive when you start to struggle with the puzzles. The object of play is simple – connect the same color of jellies with one continuous swipe that may move in all directions. It doesn’t matter where you start, but you move your finger horizontally, vertically, and diagonally to connect. The gestures are responsive and accurate, as long as you keep your fingertip on the screen. You must connect a minimum of three blobs, but you receive more points by connecting longer lines. The first several levels are super easy and accessible to anyone. You generally are trying to achieve a specified number of points, but, as you progress, you may also have a limit to the number of moves. When you complete a puzzle in fewer moves, then you will receive bonus points with exploding bright jellies and points filling the screen. Points attained in this game are quite generous. Power-ups and obstacles are naturally introduced as you progress. Connect a super jelly, and it eliminates the entire row. Connect two super jellies, and multiple rows are eliminated. You have to connect and unlock certain jellies on a board that are stuck in slime. The game board may shift and have obstacles to decrease the number of rows you can knock out and jellies you can connect. You can make in-app purchases to achieve special advantages, if you are unable to attain them through game play or a google search for cheats. The puzzles do become more challenging, as the number of points required increase and moves to achieve decrease. The Jelly Splash iPhone, iPod Touch, and iPad app is an appealing puzzler and worthy download from the iTunes App Store. 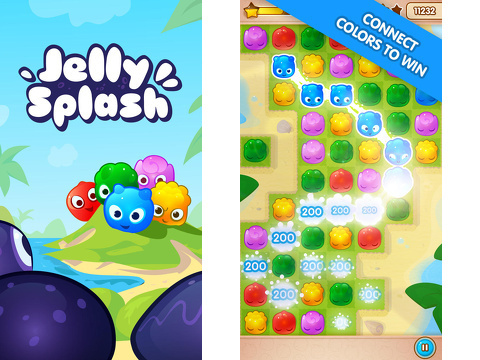 AppSafari review of Jelly Splash was written by Jenni Ward on September 6th, 2013 and categorized under App Store, Arcade, Free, Games, iPad apps, Puzzler, Universal. Page viewed 5291 times, 1 so far today. Need help on using these apps? Please read the Help Page.